Flay is one of the judges on Food Network Star. Did anyone else watch it over the summer? It’s one of my favorite reality shows. Anyone else surprised Damaris won? I thought “Pie Guy” had it in the bag! What really caught my eye in this house was the turquoise kitchen, which Flay designed himself. Instead of one big table, the room has two café tables and a farm table. “I love that my kitchen is technically a restaurant,” he says. Like it? You’ll find the full story and all the photos at Elle Decor (written by Kathleen Hackett, styled by Gregory Bissonnette, photographed by William Waldron). I like this! It has a sort of hookah bar feel to it. I love each of these rooms! I will have to follow the link and see what else Elle Décor has to show us. Food Network Star was a must-see in our household. There was none of the fake drama of other ‘star’ shows, and the raport between the judges was so refreshing. Not at all surprised that Damaris won … glad as can be that Pie Guy didn’t. Could you honestly imagine watching 30 minutes of him? Ha. I know what you mean. I was sure everyone was voting for him and that Damaris was the underdog, but she pulled it off! I haven’t seen her show yet, though, have you? I need to look for it. I loved his outdoor eating space, looked so inviting and comfortable with the screened porch keeping the bugs away! I liked the bed curtains, but not the bedspread, and the blue kitchen with the two tables left me cold. Everyone has what they love though, and that’s all that is important in the long run, that you have what floats your boat personally. 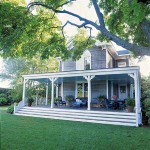 Brooke Sheilds’ house in the Hamptons was gorgeous, all the white is so soothing, and her pool was beautiful! Not what I would do, but I can appreciate it. Meh. I love the kitchen. Of course, it’s in the Hamptons, so that’s always a bonus! Not my style at all, but they look really happy there and that is what counts! Thanks Julia for letting us get a peek inside. I always wonder about famous chefs and their home kitchens. I wonder if that’s slate on the wall in the kitchen or soapstone? That is a kitchen no one else has in the world. Not that I would put something like that in my house because it’s too modern, but it obviously works really well for him. Love the screened porch. The home is nice, I won’t deny that. But to me it doesn’t seem personal. Everything seems to be perfectly placed together, but that could be for the benefit of the photographers. That house is just not interesting enough to be the subject of so much fuss. I always love to see what kitchens chefs have at home, so I would’ve liked to get a better view, but from that angle it looks a lot like a standard home kitchen, with a big stove unseen in the back. I was kind of expecting more. Maybe they put more into the outdoor version, kinda hard to see that too. The rest of the house isn’t really my style, but I will say the bathroom’s busy tile floor looks like something I’d tire of quickly and the bathtub looks uncomfortable. Basically it’s just not my style. The whole house design is amazing & it is about my style ! Turquoise kitchen is not really interesting but rather than its good & fresh ! Funny, I actually really liked the kitchen, although I must confess it’s easy to see how it might not be for everyone – colors like that are very personal. O I love it. So easy going and pretty. good thing bobby’s only kid is a girl–daughter sophie– as that living room ( pic 2) does not look comfy at all. those benches look so uncomfy. bobbys must not want people to linger at his house.